It's time to check in on our resident racecar driver, Larry Galberd! EP Minerals' Floor-Dry, the #1 absorbent for the racetrack, is one of Larry's sponsors. If you'll recall from a previous blog post, EP Minerals’ Global Technical Services Director Larry Galberd leads a double life. By day, Larry could be anywhere in the world helping our diatomaceous earth or perlite filtration customers optimize their filtration processes and solve problems. 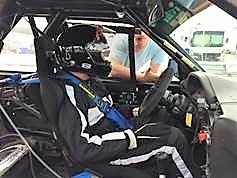 By night and on weekends (and any other chance he gets) Larry is driving hell bent for leather at 140 mph for his Blew-By-You race car team in the ChumpCar Racing Series. Larry and his team are “sponsored” (I use that term loosely) by EP Minerals’ Floor-Dry absorbent, the #1 automobile oil spill cleanup product that can be found at all the major auto supply stores today. 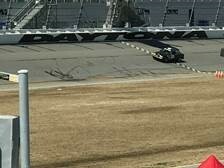 A few weeks ago, we raced our new car at Daytona International Speedway. This was a 14 hour race and we finished 9th out of 126 cars entered. We were really pleased with our top 10 finish! We had three drivers in the race, and a friend helping in the pits (and managing the Floor Dry - our sponsor - to absorb the oil spills from the car.) 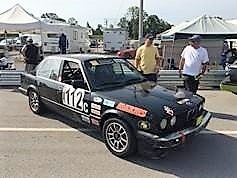 We're still racing in the Chumpcar Series, an affordable series with real racing and real cheap “Joe Average” type cars. Our new #112 is a better, faster car than I've had in the past. Then, this past weekend, we were at the National Corvette Museum racetrack for and eight hour and another seven hour race. We placed 10th on Saturday and 12th on Sunday. In the two day races we had four drivers and another good friend to help in the pits. Lots of EP Minerals' Floor-Dry was used to soak up the spills during refueling! We have three more races this year - Virginia International Speedway, Atlanta Motorsports Park, and Barber Motorsports Park. Hopefully the car will hold up to these long races. Virginia is a 24 hour race! The premise of endurance racing is to finish the race, and placement is based on how many laps are driven in the race. The faster cars with no problems will complete the most laps and prizes are awarded for the first three places. Driver stints last 2 hours after which the car must pit for a driver change, fueling and any repair work to the car. Best case scenario you are in the pits for the mandatory 5-minute pit stop and then the car re-enters the race. During the pit stop any spillage of fuel or other fluids leaked must be cleaned from the pit area. We use Floor-Dry granular diatomaceous earth (DE) absorbent to soak up these spills, and it does a great job. All of our cars are badged with EP Minerals’ Floor-Dry stickers, and the oil absorbent is used in the pits. Other teams are seeing us using Floor-Dry and asking where they can get it!